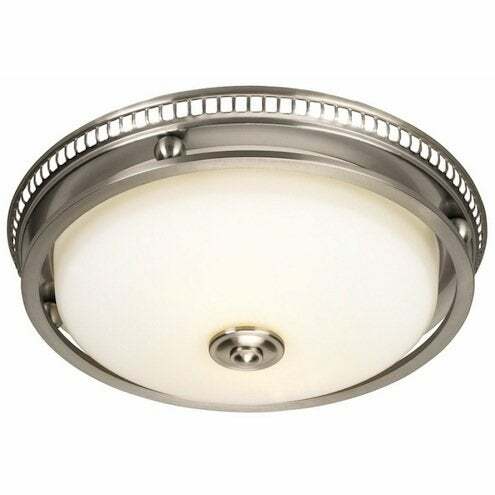 Harbor Breeze bathroom fan in brushed nickel with light from Lowes. Indoor air quality can be problematic at any time of year, but it is especially a concern during the winter months when all of the windows are sealed up tight…and nowhere is this more evident than in the bathroom. Stale air, humidity, mold, mildew and—to put it delicately—foul odors can wreak havoc with your indoor environment. The solution: install a bathroom exhaust fan. 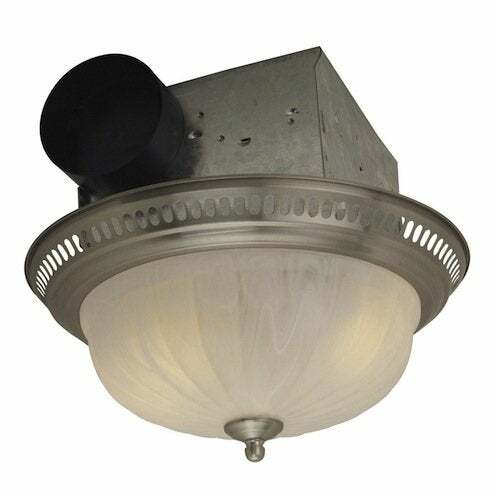 Bathroom exhaust fans typically come in one of three styles: ceiling-mounted, wall-mounted or inline/remote. Ceiling-mounted fans are installed in the ceiling and vent into the attic or out through the roof. Wall-mounted fans are mounted on the external wall of the house and generally are used when there is no practical way to vent through the roof; for example, a first-floor bathroom. 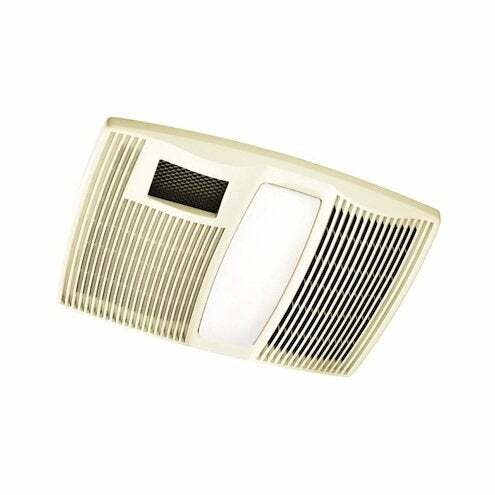 Inline fans, also known as remote fans, have a fan unit located in a remote location such as the attic; ductwork connects the fan to an opening in the bathroom ceiling covered by a grill. Inline fans are often used when a homeowner wishes to use one fan to vent multiple bathrooms, or to have multiple vents in one large bathroom. A bathroom exhaust fan is a key component to preventing humidity and moisture buildup, which can damage paint and also lead to the growth of mold and mildew. The Home Ventilating Institute recommends that every bathroom have an adequate ventilation system that changes the air eight times an hour. According to HVI, an easy approximation is to provide one cubic foot per minute (CFM) per square foot of bathroom, or a minimum of 50 CFM. So, if your bathroom measures 10 feet by 8 feet, for instance, you have 80 square feet and will want a fan rated for at least 80 CFM. For bathrooms larger than 100 square feet (10-by-10) The Institute also suggests adding 50 CFM for each toilet, shower and bathtub; and adding 100 CFM for a whirlpool tub. Once you ascertain the proper air rating, there are several other factors to consider, including noise level. Bathroom fan noise levels are measured in sones, with a higher number of sones equating to a louder fan. The HVI recommends fans with a noise level of 1.0 sones or less; there are numerous models available with ratings as low as .03 sones. Broan Polymeric White Bathroom Fan with Heater and Light at Lowes. Energy efficiency is also a consideration: Energy Star-rated bathroom fans use 20% less energy than minimum federal guidelines. Many bathroom fans also come with an on/off timer, to save electricity; humidity sensors, which cause the fan to turn on only when moisture is present; or motion sensors, which turn the fan off automatically once someone leaves the room. Features and aesthetics also come into play when choosing a bathroom exhaust fan. In one of our bathrooms, for instance, we installed a fan/light combination with a nightlight option; in another bathroom, we installed a fan/light combination with an accessory heater (which makes it particularly nice to step out of the shower!) There are also various styles from which to choose, including contemporary, traditional and industrial looks. Installing a bathroom exhaust fan is well within the reach of most do-it-yourselfers, although there are some considerations to take into account before you begin: if this is a new installation, you may have to run electrical wiring and ductwork in your attic. If you are replacing an existing fan, or replacing an existing light with a fan/light combination, you need to make sure your existing wiring can handle the additional load. And, as with most home improvement projects, make sure to check on your local building codes before you start work, to ensure that you are in full compliance with local regulations.